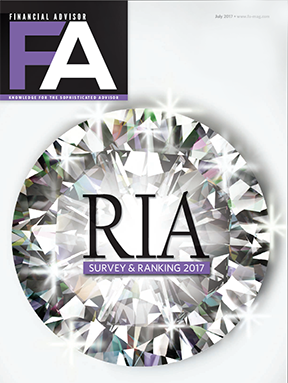 The July 2017 issue of Financial Advisor magazine ranked CAPTRUST number one among registered investment advisors (RIAs) with assets in excess of $1 billion—making it our second year running to achieve this distinction. The magazine’s annual survey analyzes several metrics, including assets under advisement, asset growth over the trailing year, and assets per client, as well as other indicators of business success. So far in 2017, CAPTRUST has completed six such M&A deals—an accomplishment made possible by CAPTRUST’s ability to meet the demands and aspirations of high performing advisors who relentlessly pursue growth, better client outcomes, and a purposeful and rewarding future. To read the article online, please visit fa-mag.com. CAPTRUST Financial Advisors is an independent investment research and fee-based advisory firm specializing in providing retirement plan and investment advisory services to retirement plan fiduciaries, executives, and high-net-worth individuals. Headquartered in Raleigh, North Carolina, the firm represents more than $240 billion in client assets with offices in Alabama, California, Connecticut, Florida, Georgia, Iowa, Michigan, Minnesota, New York, North Carolina, Ohio, Pennsylvania, and Texas.